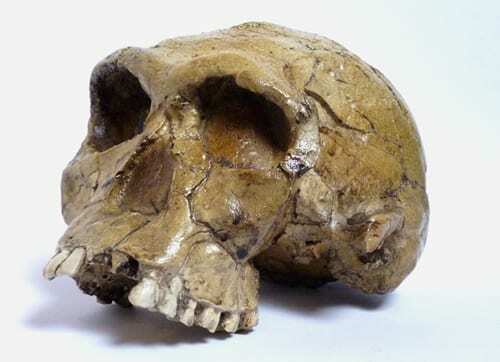 Homo habilis, which literally translates as “handy man”, is the oldest known member of the human genus. Living between 2.8 and 1.5 million years ago, they were omnivorous, social and inhabited large areas of Sub-Saharan Africa. When first discovered in the 1960’s they were differentiated from other early hominids by a number of very human characteristics. These included bigger brains, arched feet, smaller teeth, and hand bones that suggested they could handle objects with precision. Hence handy man. There are currently only seven known handy man fossils. Ours is a reproduction of the catchily named KNM-ER1813 which was found in 1973 in the Koobi Fora region of Kenya and dates from approximately 1.9 million years ago. It’s an almost complete cranium but is considerably smaller than other comparable examples. The molars are “fully erupted” and significantly worn so this cannot be the skull of a child and is most likely a small, adult female. She would probably have stood about three and half feet tall. H. habilis is widely believed to have been a prolific tool maker, using flint hand axes to butcher meat and cut up animal skins. They were originally thought to be the first apes to do so, but recent evidence places the earliest tools before the earliest H. habilis fossils. It is actually impossible to say definitively whether or not handy man used tools at all, as multiple species of early hominids co-existed in the same place at the same time. This cross-over also calls into question the idea of a linear evolutionary progression with later species moving sequentially closer to modern humans. 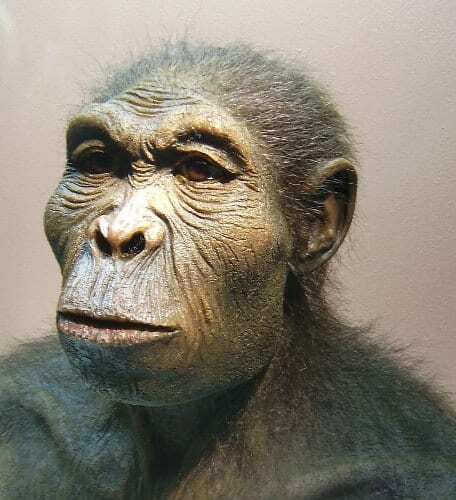 Recent finds have shown that H. habilis and H. erectus lived together in East Africa for approximately 500,000 years, for example, whereas earlier thinking was that H. erectus was a direct descendant of handy man with little or no overlap. Leakey, L.S.B., Tobias, P.V., Napier, J.R., 1964. 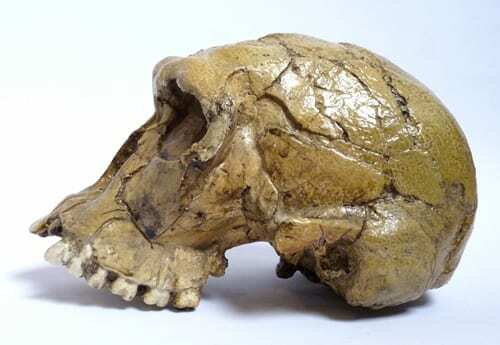 A new species of the genus Homo from Olduvai Gorge. Nature 202, 7-9. Domínguez-Rodrigo, M., Pickering, T.R., Semaw, S., Rogers, M.J., 2005. Cutmarked bones from Pliocene archaeological sites at Gona, Afar, Ethiopia: Implications for the functions of the world’s oldest stone tools. Journal of Human Evolution 48, 109-121.